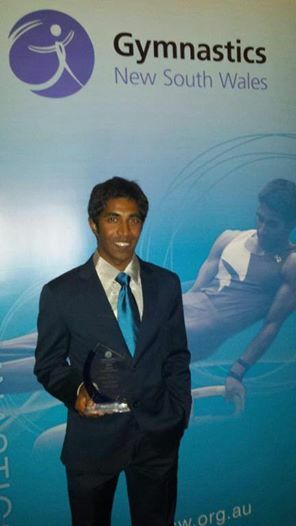 Congratulations to Prashanth Sellathurai named Men’s Elite Athlete of the Year during the Gymnastics NSW 2013 Awards held at ANZ Stadium on Sunday. In 2013, Prashanth Sellathurai won the pommel event at the NSW Titles and National Australian titles. Prashanth Sellathurai also competed in pommel at worlds and is now ranked an outstanding 8th in the world for this event. Prashanth Sellathurai is a star gymnast of the Sydney Olympic Park’s Men’s Gymnastics Club, training with a team of athletes at the Sports Centre. Want to know more about gymnastics? Sydney Olympic Park Sports Centre provides a range of sporting opportunities for community participation through to supporting elite athletes. The Gymnastics Club offers a Kindergym program for 3–5 year olds, recreational classes for 5–12 year olds and competitive women’s and men’s artistic gymnastics program. More information can be found at www.sports-centre.com.au or by calling 02 9763 0111. ‹ Happy one year anniversary Bella Panini!